Reinforced thermoplastic pipe (RTP for short) has inner plastic pipe layer, middle reinforced layer, and outer protective layer. The materials of inner pipe are PE80, PE100, PA, PERT or PVDF. The middle layer is interweaved wrapping reinforced material with a certain wrapping angle, and the reinforced materials can be aramid fiber, PET fiber, fiberglass, or steel wire. The outer protective layer is HDPE layer adding with antiaging agent and uvioresistant agent. RTP pipe has excellent flexibility and very high pressure resistance, can be provided by coil, long distance laying without joint. This kind of pipe is mainly used in oil, natural gas, high pressure water and special fluid transportation. Depending on its strength on composite pipe technology for over 20 years. 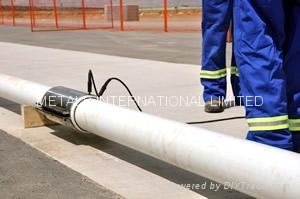 The reinforced thermoplastic pipe is called as RTP for short. Its structure is inner layer, middle reinforced layer, and outer protective layer. The materials of the inner layer are PE80, PE100, PA, PERT and PVDF. The middle layer is interweaved wrapping reinforced material with a certain wrapping angle, and the reinforced materials can be aramid fiber, PET fiber, fiberglass, or steel wire. The outer protective layer is HDPE layer adding with antiaging agent and uvioresistant agent. RTP pipe has excellent flexibility and very high pressure resistance, can be provided by coil, long distance laying without joint. This kind of pipe is mainly used in oil, natural gas, high pressure water and special fluid transportation. High pressure resistance with the working pressure up to 32Mpa (320bar). 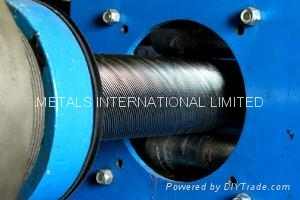 The pipe has excellent flexibility, and the pipes whose diameter being smaller than 200mm ;can be provided by coil. Therefore, this kind of pipe is convenient to be transported and easy and rapid to be laid with low construction cost. Good impact resistance without crack or leakage under strong deformation. Corrosion resistance with the service life over 20 years in strong corrosive fluid, low system cost. Low comprehensive cost, wide application scope, suitable to be used in long distance transportation such as oil, natural gas, coal gas, and chemical industry, etc. The common dimensions are 3 inch 15Mpa, 4 inch 10Mpa, 5 inch 8Mpa. RTP Linepipe is a spooled, ready-made pipeline system used for applications where a corrosion resistant, high pressure pipeline is required. The patented three-layer design is contrasted from a thermoplastic liner, helically wrapped continuous high-strength fiber reinforcement and an external thermoplastic jacket. 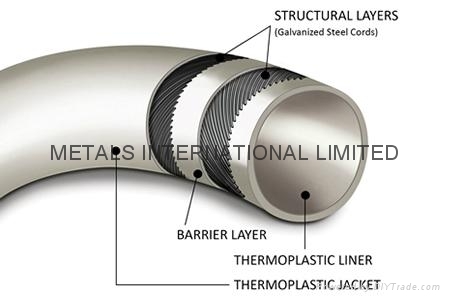 The liner acts as a corrosion resistant bladder, the fibers provide the structural integrity of the pipeline, and the jacket protects the load-bearing fibers. •The inner liner, which serves as a conduit for the transmission fluid and/or gas, is made of high density polyethylene (HDPE) making it immune to corrosion. •The middle layer comprised of helically wound, dry fiberglass fibers which provide the pipe’s structural integrity. •The outer jacket is a protective barrier made of high density polyethylene (HDPE). The standard linepipe is supplied with a black jacket, which provides a minimum of 20 years protection against exposure to ultraviolet (UV) light. White THE Linepipe is available for applications which require low heat absorption, and also provides a minimum of 20 years UV protection. A yellow jacket is often used by the utilities industry and is available as a custom order. •THE Linepipe has a maximum operating temperature of 60°C or 140°F. •THE Linepipe is the high temperature series and is available in 2”, 3” and 4” sizes with a 600 ANSI pressure rating at a maximum operating temperature of 82°C or 180°F. •The reinforcement layers are not encased in a thermosetting matrix and are therefore flexible, avoiding potential micro-cracking or over-straining of a matrix material. •THE Linepipe is very durable and easy to handle. •The simplicity of construction reduces the manufacturing costs providing an economic alternative to traditional steel or fiberglass pipeline systems. 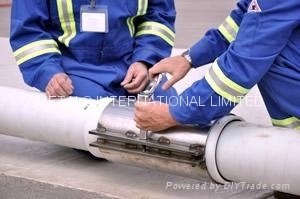 •The liner ensures that the pipeline is immune to corrosion and eliminates the need for inspections and costly corrosion inhibitor programs. •The continuous, long-length spools facilitate fast and easy installation with fewer connections. •ASTM F2686-10 – THE RTP Linepipe is accepted as an ASTM International Standard as specified in “Standard Specification for Glass Fiber Reinforced Thermoplastic Pipe”. •API (American Petroleum Institute) - OUR products are designed, qualified, and manufactured in accordance with API RP 15S, “Recommended Practice for the Qualification of Spoolable Reinforced Plastic Line Pipe”. •ASME – OUR Flanges are compliant with the requirements of ASME B16.5, “Pipe Flanges and Flanged Fittings”. •ISO 9001:2008 – Our core manufacturing facility meets the requirements of ISO 9001:2008, “Quality Management Systems - Requirements”. •CSA (Canadian Standards Association) – RTP products meet the requirements of CSA Z662-07, “Oil and Gas Pipeline Systems”, which covers the design, construction, operation, and maintenance of oil and gas industry pipeline systems. •ERCB (Energy Resources Conservation Board) – governing body in Alberta, Canada. ◦The ERCB allows RTP Linepipe applications to be processed as routine for fresh water, salt water, multiphase, crude oil/LVP, and natural gas service (including sour service). Directive 056 confirms the suitability of THE RTP Linepipe for gas applications up to the CSA Z662-07 limit of 9930 kPa and for other types of applications up to maximum pressure rating. This speciÞcation covers Þlament wound (FW) and centrifugally cast (CC) Þberglass line pipe and Þttings for pipe in diameters up to and including 24 in. in diameter and up to and including 1000 psig cyclic operating pressures. In addition, at the manufacturerÕs option, the pipe may also be rated for static operating pressures up to 1000 psig. It is recommended that the pipe and Þttings be purchased by cyclic pressure rating. The standard pressure ratings range from 150 psig to 300 psig in 50 psig increments, and from 300 psig to 1000 psig in 100 psig increments, based on either cyclic pressure (ref. 5.5.1) or static pressure (ref. 5.5.2). Quality control tests, hydrostatic mill tests, dimensions, weights, material properties, physical properties, and minimum performance requirements are included. 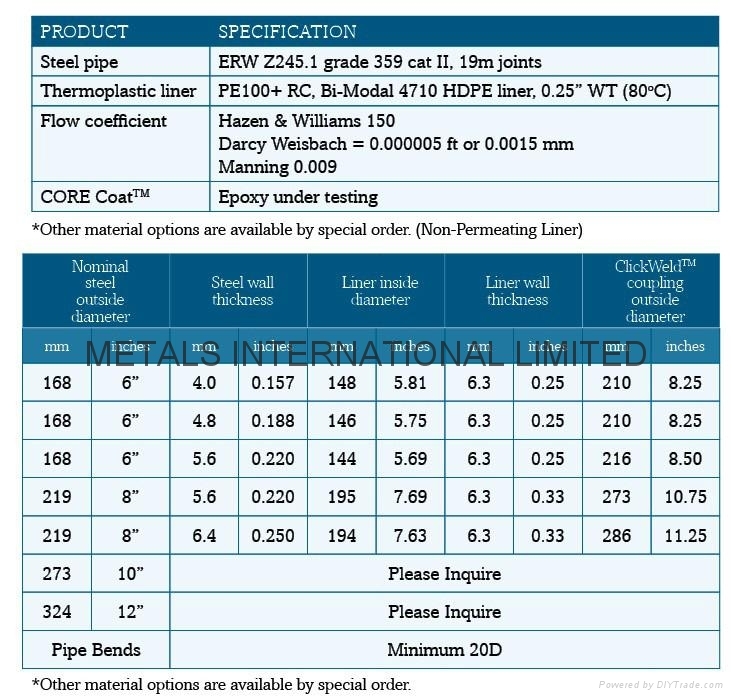 This specification was formulated to provide for the availability of safe, dimensionally, and functionally interchangeable high-pressure fiberglass line pipe with a pressure rating from 500 lbf/in.2 to 5000 lbf/in.2 (3.45 MPa to 34.5 MPa), inclusive, in 250 lbf/in.2 (1.72 MPa) increments for pipes ≤ than NPS 12 inches and 100 lbf/in.2 (0.69 MPa) increments for pipes ˃ than NPS 12 inches. This specification is limited to mechanical connections and the technical content provides requirements for performance, design, materials, tests and inspection, marking, handling, storing, and shipping. Critical components are items of equipment having requirements specified in this document. 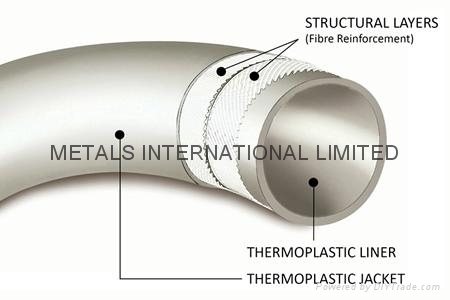 This specification is applicable to rigid pipe components made from thermosetting resins and reinforced with glass fibers. Typical thermosetting resins are epoxy, polyester, vinyl ester, and phenolic. Thermoplastic resins are excluded from the scope of this specification. 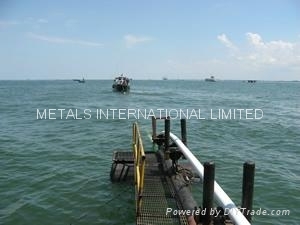 Any internal liners applied shall be made also from thermosetting resins. Fiberglass line pipe for use in low-pressure systems are covered in API Spec 15LR. This specification covers fiberglass pipe utilized for the production of oil and gas. Specific equipment covered by this specification is high-pressure line pipe and couplings, fittings, flanges, and reducers and adapters. 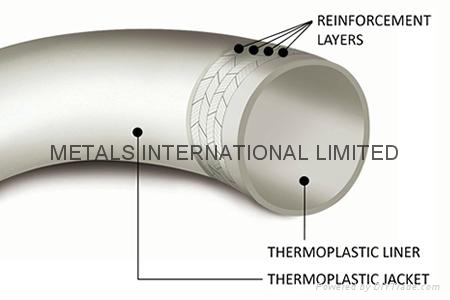 Specifications︰ Reinforced Thermoplastic Pipe is one kind of high pressured plastic compound tube, consisted of three layers, the outer layer and liner are a PE80 or PE100, the outer layer according to needs to be possible to choose the white color (on the ground against ultraviolet ray) or the black color (under ground), the intermediate layer is the enhanced tape, the reinforced material may be the polyester fiber or the aramid fiber and so on. The pipes use many kinds of connection forms such as enhancement inline coupling, swaging fitting, flanged joint to connect. The RTP pipe general application temperature for -42ºC~135ºC, the max operation pressure may reach 32MPa most greatly. The RTP pipe has the high loading capacity. By choosing different enhancement material, the maximum service pressure may achieve 32MPa, and the bursting pressure may even reach as high as above 100MPa. The RTP pipe's application temperature scope is - 42ºC~135ºC, may satisfy the temperature demands of the majority situations, and the thermal conductivity is only 0.48w/m*k, which is the 1/100 of steel pipe. The inner wall of RTP pipe is very smooth, hard for scaling and wax precipitation, the flow resistance is low, high wear-resistance, delivery capacity lasting invariable, so the transported pipeline's maintenance cost is reduced. (1)The material of RTP pipe's inner pipe is polyolefin, so the roughness equivalent of inner wall may reach 0.05mm, but under ordinary circumstances steel pipe roughness equivalent achieves 0.19mm, the used steel pipe even reaches 0.60mm. (2)RTP delivery capacity surpasses the conventional pipeline 50%. RTP pipe toughness is extremely high, has the good impact resistance, and good ability of anti-ground vehicle load ability, anti-soil deposition, anti-earthquake and so on. Since the RTP pipe has good flexibility, usually carries on the nature compensation through the serpentine layout while installing, with no need of the thermal compensation installation, and thus saves the installation cost. (2) The RTP pipe tensile strength is high, when pipe is lay down, the long time maximum puling force may amount to 5 tons, and the instantaneous maximum puling force may amount to 10 tons. 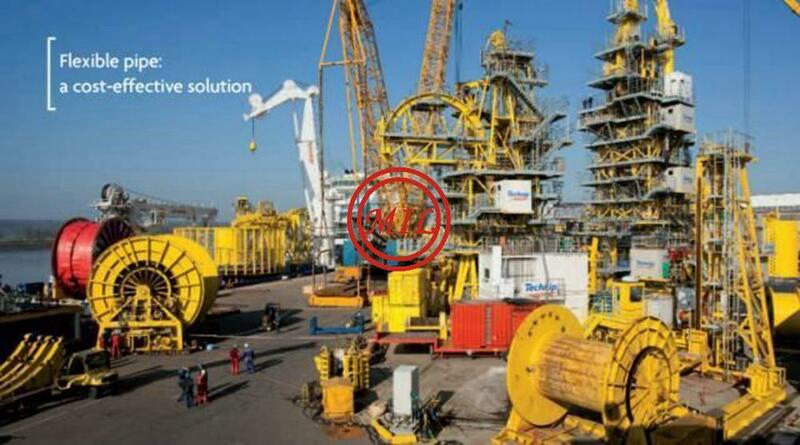 The single length of RTP without fitting may amounts to 150-400 meters, therefore joints are very few to the pipeline, and the reliability is higher, the cost is saved. Demonstrated according to the German Weicon Company that compares with the carbon steel pipeline, the RTP pipe may save over 25% of investment totally. The RTP pipes, non-toxicity, does not decompose, is the environment friendly green material. 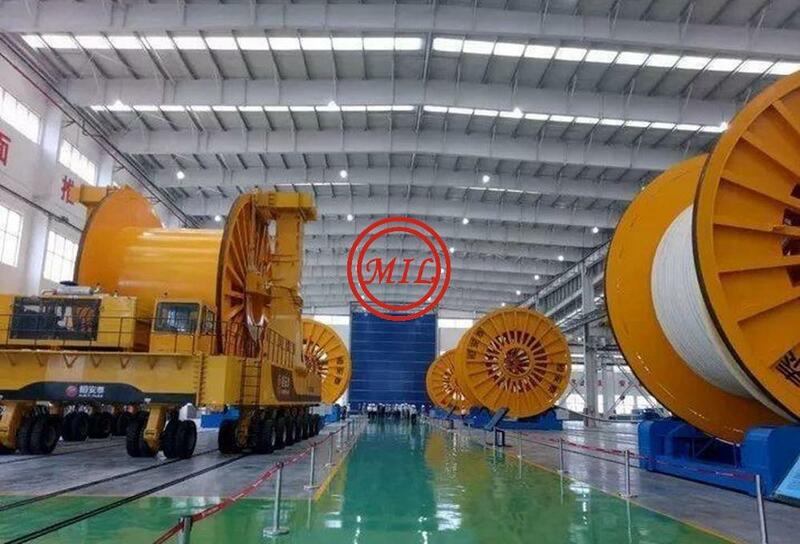 It conforms to the GB/T 17219-1998 transmission and distribution equipment of domestic potable water and the shielding material security evaluation criteria. The RTP's working life can be designed according to customer requirements, and the max working pressure can reach 50 years.